The evening’s theme was “The Art of the Cure,” emphasizing that while science is at the center of Expect Miracles Foundation’s life-saving mission, what fuels the science is more of an art, such as the relationships between firms, between people, between friends who share common interests and goals—like working in the same industry and wanting to save loved ones from the scourge of cancer. After sampling delicious dining bars and creative cocktails, guests turned their attention to the stage for the event’s speaking program. 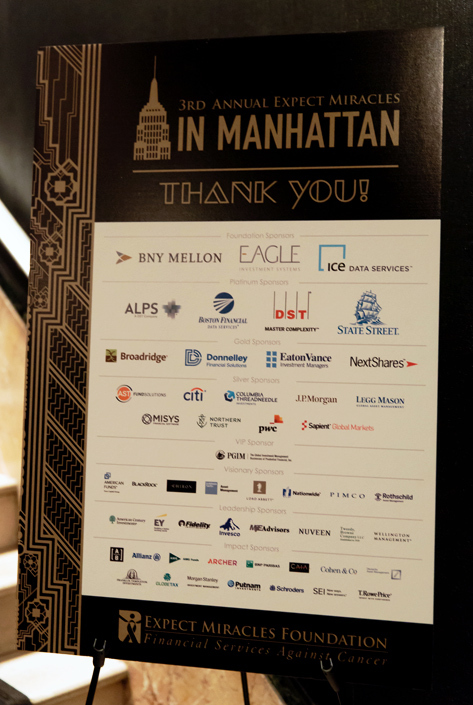 Event Co-Chair Ben Huneke, Morgan Stanley Wealth Management, thanked guests for “using their personal and business relationships to save lives.” Ben then introduced his Event Co-Chair from Merrill Lynch, John Pavese. John reiterated Ben’s thanks to all attendees, shared how cancer impacted his life, and urged everyone to use the platform offered by Expect Miracles Foundation to make a difference. The evening’s Live Auction, which featured a trip to The Masters, stays in Mexico, Las Vegas, and Atlantic City, a custom suit and more, added to the record-breaking fundraising of the evening. Dr. Daniel Heller, from Memorial Sloan Kettering Cancer Center, thanked the attendees for their financial support. It is through the support of event’s like this that Dr. Heller was able to develop an approach involving nanoparticles to deliver drugs specifically to cancer sites, including metastatic tumors by utilizing the same mechanism cancer uses to metastasize. Founder and Chairman of Expect Miracles Foundation, Frank Strauss from Accenture, paid tribute to friends of Expect Miracles Foundation we lost to cancer by remembering Charlie Hallac and Brian Schmidt from BlackRock. 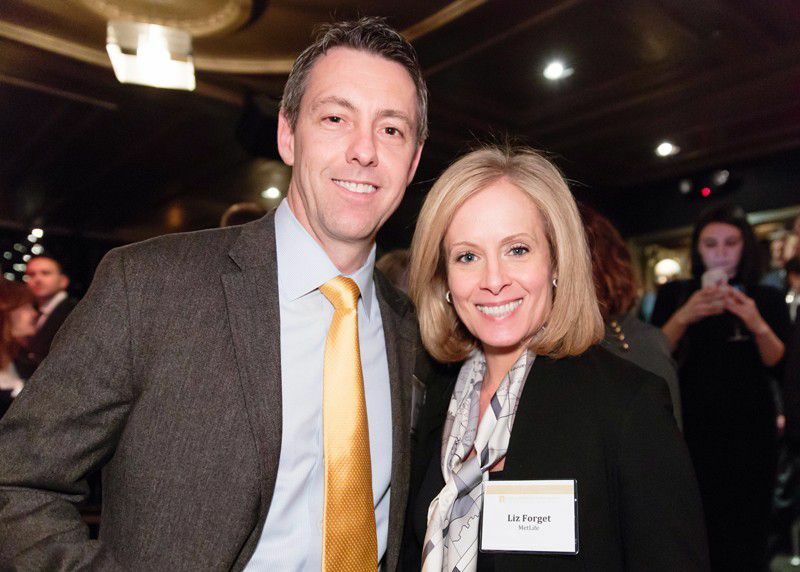 Frank recognized the tragic passing of Erin Brenner, from Schroders, who ran the Boston marathon multiple times for Expect Miracles Foundation and raised over $20,000 for the mission. To conclude the speaking program Frank Strauss presented two very important awards. The YPEM Award was presented to Matt Mackay from J.P. Morgan, in recognition of a young professional whose exceptional contribution of time, resources, and energy rallies the next generation of financial executives to support the life-saving mission of Expect Miracles Foundation. The Expect Miracles Award was presented to Jeff Masom from Legg Mason. Awarded in memory of Steve Katzin, co-founder of the Foundation, the Expect Miracles Award recognizes the individual or organization that in the spirit of Steve, best utilizes their influence on others and generous spirit for the betterment of society, and goes above an beyond to donate or raise significant funds for Expect Miracles Foundation. Thank you to our wonderful guests, sponsors, partners and volunteers – YOU are the Cure! You can check out even more photos on our Facebook Page. We hope to see you at our next event, the 23rd Annual East Coast Charity Golf Classic on June 8, 2017 in Plymouth, MA.